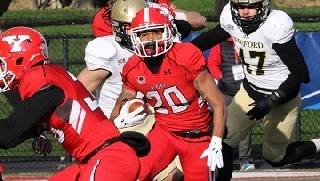 Tevin McCaster rushed for a go-ahead touchdown in double-overtime, and the Youngstown State football team battled for a 30-23 win in double overtime over Wofford in the quarterfinals of the 2016 FCS Playoffs. The Penguins will advance to play Eastern Washington in the semifinals next week. Senior tailback Jody Webb set a new school record with 331 all-purpose yards, and junior quarterback Hunter Wells passed for three touchdowns as the Penguins won their 16th straight postseason game at Stambaugh Stadium. Webb rushed for a career-high 213 yards and added 118 on kickoff returns. Wofford came into the contest surrendering just 91.2 yards per game on the ground. Youngstown State trailed 9-0 at the end of the first quarter, and it scored 13 points in the second to take a 13-9 lead at halftime. Wofford scored on the first play from scrimmage in the second half to go up 16-13. Wells connected with Isiah Scott on a five-yard touchdown pass with 1:33 left in the third quarter to put the Penguins up 20-16, but Wofford answered with a 13-play drive that put the Terriers ahead 23-20. YSU's Zak Kennedy made a 32-yard field goal with 5:04 left to tie the score at 23, and Wofford's David Marvin missed a 53-yard field goal at the end of regulation. The Terriers fumbled on fourth-and-goal on their first possession of the first overtime, and Kennedy missed a 37-yard attempt on YSU's turn. McCaster's two-yard plunge put the Penguins up 30-23, and YSU's defense did not allow Wofford to gain a first down. Youngstown State had to battle through adversity to earn a trip to the FCS final four as it overcame three missed field goals, a missed extra point, a blocked punt and two turnovers. Mason Alstatt blocked Mark Schuler's punt on YSU's first drive of the game to set up a one-yard touchdown rush by Lorenzo Long. After Wofford missed its extra point, the Penguins' second drive ended with a missed 43-yard field goal. Wells was then intercepted on their third drive to set up a 37-yard field goal by Marvin that put Wofford up 9-0. The Penguins converted three third downs, including third-and-11 on a pass from Wells to Townsend on one, to set up their first score of the game. On third-and-goal from the 9, Wells and Townsend connected again for a score to make the score 9-6 with 4:51 left. YSU also missed its point after attempt. After a Wofford punt, it took just two plays for the Penguins to go ahead when Wells and Damoun Patterson connected on a 45-yard touchdown. Kennedy's point-after made the score 13-9, and it remained that at the end of the half. Wofford quarterback Joe Newman ran for 75 yards on the first play of the second half to put the Terriers back on top 16-13. Youngstown State went back on top with 1:33 left in the third on Wells' five-yard touchdown pass to Scott. Webb ran seven times for 49 yards on the drive, which included a 31-yarder. On the Terriers' ensuing possession, they converted three third downs and took 7:11 off the clock on a drive that ended with a six-yard touchdown by Long. YSU answered with Kennedy's 32-yard field goal with 5:04 remaining that tied the game at 54. Wofford had a chance at the end of regulation to win the game but came up empty. The Terriers took over at the YSU 43 and gained seven yards on three plays. Marvin's 53-yard field-goal attempt was well short. In the first possession of the first overtime, Wofford elected to go for a touchdown instead of a field goal on fourth-and-one from the YSU 2. Newman fumbled the ball out of bounds on a late pitch, and YSU took over with a chance to win. The Penguins gained five yards on three plays, and Kennedy's potential game-winner went wide right from 37 yards. On the first possession of the second overtime, Wells and Bailey connected for eight yards on third-and-four to set the Penguins up at the Wofford 11. Webb rushed twice for nine yards, and McCaster followed with the two-yard score that ended up being the game winner. Connor McFadden's extra point made the score 30-23.